The new Ford Endeavour has moved the goal posts for premium SUVs with its imposing stance, butch design, potent engine options and a feature-rich equipment list. Add to the matter, the Ford’s attractive pricing and the segment-leading Toyota Fortuner has been left with a lot to worry about. Here is a look at how the two pioneering premium SUVs stand against each other, on paper that is. 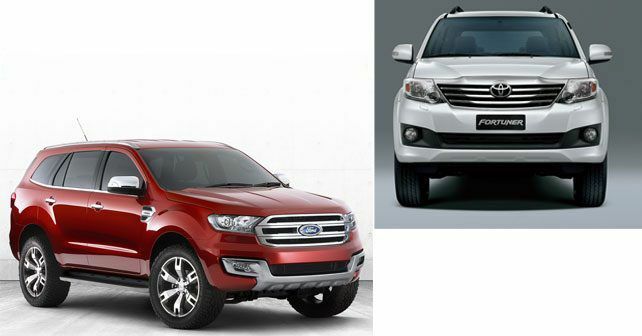 The Ford is clearly the larger car here by being longer and wider than the Fortuner which is slightly taller. But the Endeavour has a class leading 225mm of ground clearance and a whopping capability of wading through 800mm of water! This makes the Endeavour combined with all of its clean contemporary design cues quite an attractive vehicle to look at. And while the Fortuner has always been a good looking vehicle, the Ford has now moved past on the overall design aspect. With its dual tone layout, large seats, numerous (30) storage spaces and chunky steering wheel, the cabin of the new Endeavour is as good a place to be as any. To further convenience, the Endeavour comes with electric adjust for the driver’s seat (like the Fortuner) but gets electric folding third row seats as well. Combine this with a semi-automatic parallel park assist, cruise control, auto dimming IRVM, heated ORVMs, etc and the new Endeavour is significantly better equipped than the Fortuner which has been around for a long time now. Here is a closer look at the feature list of both these SUVs. Both the Ford Endeavour and Toyota Fortuner come with two powertrain choices, a slightly smaller capacity engine in the more affordable variants featuring two-wheel drive and a manual gearbox while the higher end models get a bigger engine with all-wheel drive and an automatic gearbox. Here is a look at the different powertrain versions of the Fortuner and Endeavour. Considering the nature of these vehicles, both of them are underpinned by ladder frame chassis. The Fortuner has a double wishbone front suspension while the Endeavour has an independent setup at the front. At the back, the Fortuner sports a four link setup while the Endeavor gets a Watts link type suspension. The Endeavour is offered with front and rear disc brakes while the Fortuner has drum brakes at the rear. Being a newer model, the Endeavour comes loaded with a host of driver aids and safety features to become one of the best safety equipped vehicles in its price range. Here is a look at what it has to offer. The Toyota Fortuner has been India’s favourite premium SUV with its extremely reliable nature, road presence, low running costs and overall value. Now though, the new Ford Endeavour has taken the fight to its arch rival with ferocity. The Endeavour is better equipped, looks imposing and has been priced very well. It sure looks like there will be a tough battle between these two. Keep a look out on the sales charts to see which one takes the crown.